WELCOME TO TACKLE TWILL PRO! Tackle Twill Pro now features specialty fabrics, including the patriotic "Galaxy" and "Stars and Bars" fabrics and our brand new "Spider Web" fabric that can be combined with our standard tackle twills for that professional look! Welcome to the Tackle Twill Pro Web Site, featuring Professional Tackle Twill Numbers, Letters and Nameplates for one jersey... or Special Prices for Logos, Numbers and Letters for an entire team! our many customers include professional teams! Tackle Twill Pro features pro quality tackle twill numbers at low, low prices! 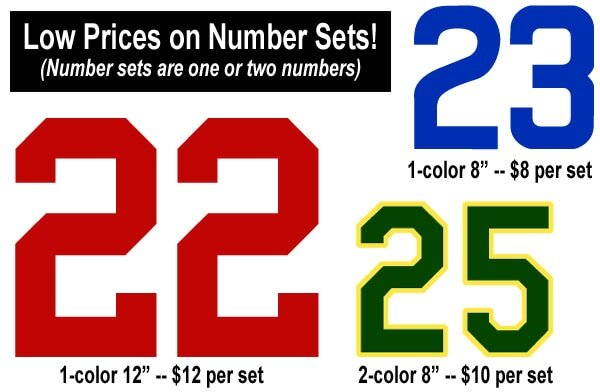 For example, our baseball numbers are just $8 for a 1-color number set (one or two numbers) or just $10 for a 2-color number set. CLICK HERE for baseball numbers and lettering. CLICK HERE for football and hockey numbers. Tackle Twill Pro features professional quality, layered tackle twill letters and numbers -- just like the pros wear! Layers are zig-zag stitched together and ready to heat press (or iron on) and sew to your jersey. Order lettering for one jersey of check out discounts for team orders! Add your own name with our pre-cut letters -- in any size and color. Just sew on to your shirt. Nameplates are also available and come in a variety of fabrics and colors including black, white, red, orange, brown, navy blue, royal blue, grey, kelly and forest green. 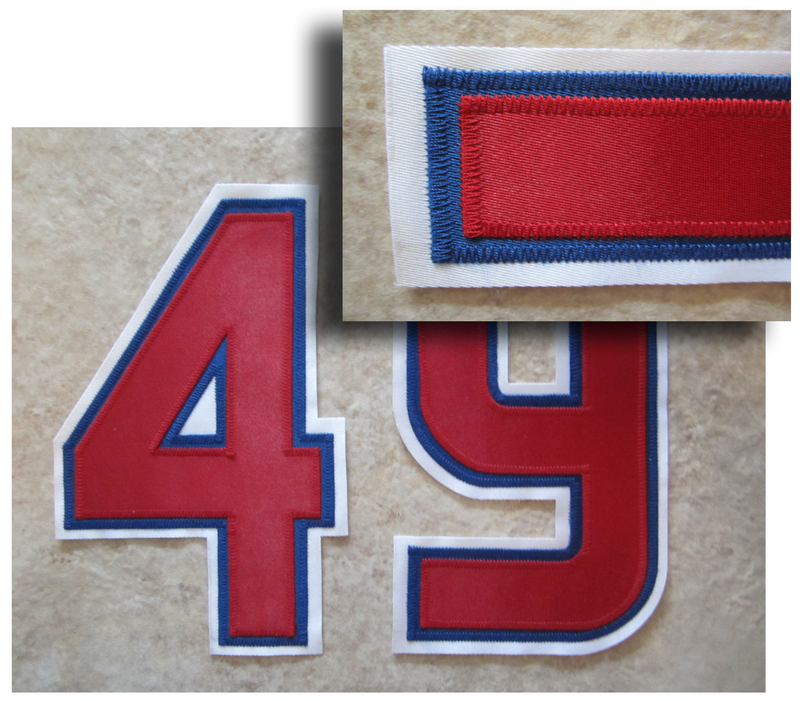 Letter your football and hockey jerseys with our wide selection of tackle twill numbers and letters. Nameplates also available. Everything is the same quality as professional teams! Our expert computer graphic artists can duplicate just about any lettering style. Popular artworks are already on file and ready for your jersey! Our artists are BIG sports fans! Custom cuts can also be done for your own sports teams, dance teams, cheerleading and cheer squads! Ask about custom pricing for your logos. A small art charge may apply. SPECIAL PRICES for Cheer and Dance Teams! combined with our huge selection of background colors.